Yeah, this is going to take longer than expected. Part of it is because the work load is tightening up, and part of it is because OTHER things are coming along that I should talk about (like, um, other plays and ... economic stuff). In episode six we talked about how change really happens from below as opposed to being awarded from above. So now we flip to the other side with the seventh installment of Mike Daisey's "A People's History", switching from the renters seeking redress to the elites of the system, the giants of industry, the wealthy. Daisey comes in the basic assumption that "Rich People Are Bad" and he has more than enough examples of that. These elites come from success and just get richer. And there are a lot of good examples of this. JP Morgan was the son of a financier. Andrew Mellon was a banker's son. Rockefeller's dad was literally a con man. 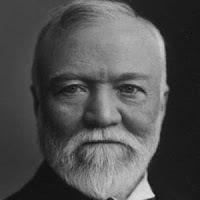 And then there is Andrew Carnegie, the exception that tests the rule. And it is pronounce Car-NEG-ee, as far as native of Pittsburgh are concerned. CAR-neh-gee is something New Yawkers talk about when talking about Carnegie Hall. Yes, some Pittsburghers call the museum complex that houses Car-NEG-ee's dinosaurs the CAR-neh-gee. But they're just wrong. Andrew Carnegie is Horatio Alger as written by Stan Lee. He was an immigrant from Scotland. Came here as a child because his father's handmade lace business was destroyed by the arrival of high-production industrial methods. He comes to the States and became a bobbin boy, working at the very type of mills that destroyed his father. He got breaks - access to the libraries of the more successful (hence all the Carnegie Libraries around the country). He was diligent, and never forgot a fact, a name, or an opportunity. He claimed to be able to read a teletype by the sound it made making each letter. Yep, he's a mutant, suitable for Prof. Xavier's School for Exceptional and Privileged Children. Instead of Money Comes from Money, I would propose that what really happens is "Learn the Game, Play the Game, Change the Game." And those born into positions of power are more capable of seeing the game and have access to it than most of the rest of our bunch. Because the nature of wealth does change over time, and we've seen agricultural fortunes flounder while industrialists come to the fore and then they are overtaken by financial managers and tech lords. But the wealthy, while not guaranteed success, have both table stakes to get into the game to begin with, as well as the cushion for when they fail. And they have the ability to, once they make their pile, pull up the ladder behind them to keep others from doing the same thing they did. Nope. Not letting CaNEGie off the hook, here. Just looking for a broader pattern. I love charts. This one, from Wikipedia, is lying to you. 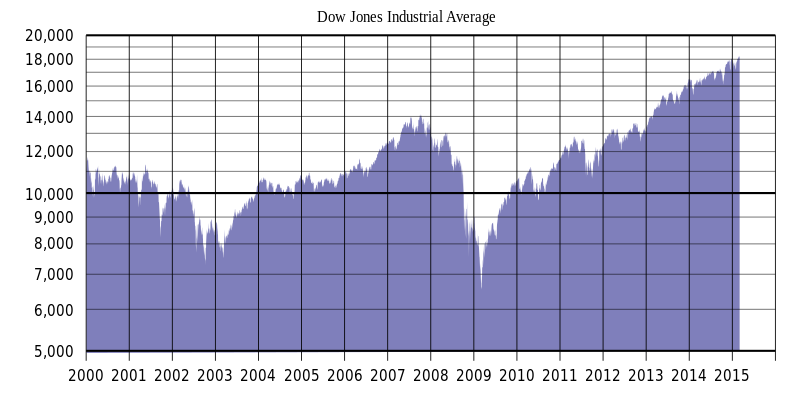 So, for the most of the life of this blog, I have been following the Dow Jones Average, as it has become increasingly disconnected with most of our lives, if they were even initially. Literally an estimate of 30 large publicly owned companies,. It is a rogue's gallery of corporations, the big boy's table if the titans of industry, the whales of corporate life. It tends to be a little conservative, moving slowly over time to move aside old corps (like General Electric) in favor of newish blood (like WalMart and Apple). Amazon, it must be noted, is not on the list. At best, it is a snapshot, but it is a snapshot that we all know about. We may be befuddled by S&P and NASDAQ and know that our retirement funds are in some business-level melange of stocks that may or may not be on these lists. But the Dow (named after a real person who created it), is something instantaneously recognized as the heartbeat of business. And that heartbeat has picked up a bit of arrhythmia. Over the past fifteen years, this blog has seen the DOW soar upwards and crash mightily, only to regain its footing and push on to even greater heights. I use this as an example of American Optimism at its finest - if we all clap hard enough, Tinkerbell will pull herself off the tarpaulin and we will start again. And the past ten years or so have been pretty indicative of this. It has been an even-growing increase in value ever since the last time a GOP administration crashed us into the pavement. And yeah, I'll put it on the various incumbent administrations for things, since they are more than willing to take the credit when things are going boffo. Until recently, the White House has been pointing at the DOW as indication of how strong the country is economically. Until it isn't. The first year of an administration has to deal with the successes and failure of the previous admins, for good and ill. The Obama administration had to dig out from the Great Recession, and the current administration of Individual-One benefited from a strong economy coming in. This was made even better, as far as the big boys were concerned, by tax policies that put a lot of loose cash into their pockets. And some of them used this sudden infusion to reward its workers, to update its equipment, and to compete better in the marketplace. But the vast bulk of them used it to buy back shares (making the shares controlled by the company worth more through scarcity) and to use the sudden liquidity to get rid of ailing sectors (closing down factories and costing jobs) and seeking better markets (closing down factories and costing jobs). And since there were no strings on the governmental largess, they took the money and ran. And the market has seen amazing swings upwards and downwards, depending on the mood. It raced past 24k and 25k is long, looping arcs, and kissed 26,000 before retreating again. Now, the news is bad - trade wars, instability, the government being currently shut down, increased interest rates from the Federal Reserve, and, oh yeah, massive investigations of the inherent corruption of the current administration that could at any moment result in a congressional investigation of your particular industry. So things are not looking particularly rosy? Well, then we the treasury secretary calling the major banks from his vacation and yelling at them - "Whatever you do, Don't panic!" So naturally things take another dive. And what does this all mean? For those that have gold, it means they make less gold for a while, they hunker down, make safe bets, and wait for Tinkerbell to get back off the mat. For the rest of us, it means that things are probably only going to get dicier for a while. Factories get closed because there isn't enough demand, as opposed to just boosting the bottom line. Those mutual funds? Yeah, they're not going ever onward and upward. And more than a few rich people to come demanding other people pay to keep them rich. Of course, with a volatile market, it could switch gears just as violently and return to "normal" (which is to say, going ever upwards). Or it could just sink again, returning to a more rational level. Whatever happens, it will be interesting. Buckle in. Grubbstreet wishes everyone a safe and sane holiday season, and a New Year filled with promise and hope. 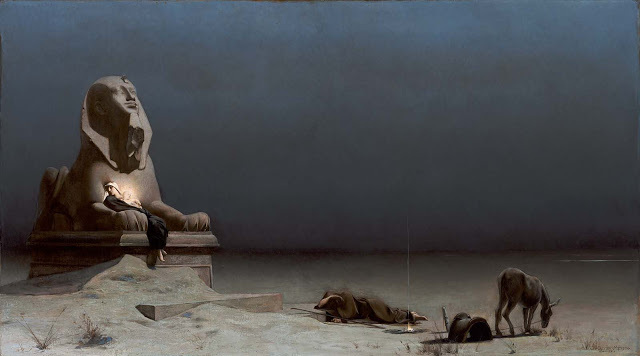 Rest on the Flight into Egypt by Luc Olivier Merson (1879), MFA, Boston. 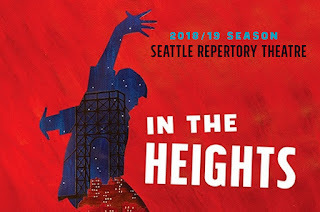 In The Heights, Music and Lyrics by Lin-Manuel Miranda, Book by Quiara Alegria Hudes, Concept by Lin-Manuel Miranda, Directed by May Adrales. 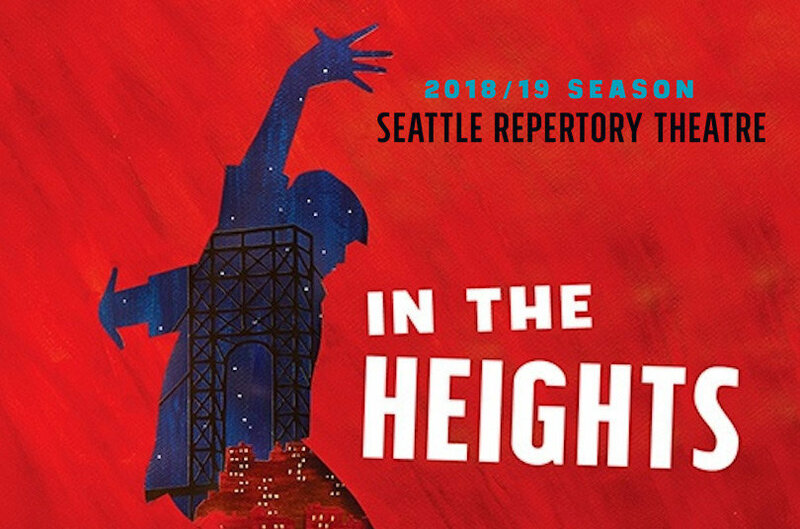 Seattle Rep through December 30. So there is such a thing a performance being too large for the hall that contains it. I've always thought of the venerable Bagley-Wright Theater as being a large venue with a lot of space on stage. Yet, for In The Heights, it is seriously too small, both on stage and as far as sound quality is concerned. Let me deal with this bad news first before pushing on to say how good the cast is. The sound quality from the performance pitched the on-stage band against the miked-up actors, and the result was an unsatisfying tie. Often the words got lost in the upswelling music, and the audience was at times blasted by the resulting combined volume. It took much of the opening number for my ears to adjust and actually hear the words. The touring stage was a great design of multiple levels and exits, but it cramps the forward part of the stage, and I found myself marveling at the dancers not getting in each others' ways as much as their superior choreography. And yes, the dancing is fantastic, the music is ecstatic, and the actors are all superior both in acting ability and the power of their voices. There isn't a weak singer in the lot (By way of comparison, you can give the role of the tailor in The Mikado to someone who does not have a huge amount of vocal range). This is an incredibly amazing cast from the leads to the ensemble who do their darnedest to sell the story. And the story is, well, it is not the selling point. I can't give you a good summary without tipping my hand to spoilers, as you can see where everything is going from the get-go. It takes place over the 4th of July weekend in Washington Heights, a strong Hispanic community at the northern tip of Manhattan. Poor but proud, its people are second and third generation, both American and loyal to their family heritages. They've made something of themselves, and can make a bit more, but it may mean moving away from the Heights. There is the bodega owner that wants to go back to his family's homeland. There is the student coming back from college. There is the father who has hopes for his daughter. There are the girls who work in the beauty shop. There is the neighborhood matriarch. Everybody gets their moment, everybody gets their song, everybody aims for a showstopper. There are revelations. There are fireworks. There is a power black-out. There is a winning lottery ticket. And by the end of it all, every character has their arc resolved in time for the finale. The stakes in all this, however, are pretty low, and it is more of a slice of life with strong Latin flavor and a hip-hop beat. The threats are pretty mild, and when one of them seems about to rear its head, it diffused and lets all the air out. There are no real surprises. As I said, so much of what is good about this performance are the performers. Ryan Alvarado, Sophia Macias, David Kaverman, Alyssa Gomez, Stephanie Gomerez, Tony Chirolders, Karmine Alers and Yassmin Alers (yes, sisters), heck yes, even Henry Gainsa as the Piragua Guy engaged in a life-and-death struggle with Mr. Softee. All great. I want to say that this is riding on the coat-tails of Lin-Manuel (Hamilton!) 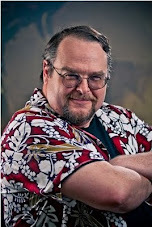 Miranda - they promote that angle heavily, and it was his first work. But the original show (pre-Ham) pulled down all manner of awards both on and off Broadway, has had some serious national tours (It was here in Seattle at the 5th Avenue in 2010 - probably a better venue), and will become a movie in 2020. There is something here that engages and delights, but it doesn't have that much foundation to it. This is one of those plays where I look at 4 Tony Awards (as opposed to a single award for the clearly superior Come From Away), and wonder what I am missing about the tastes of Modern American Theatre.